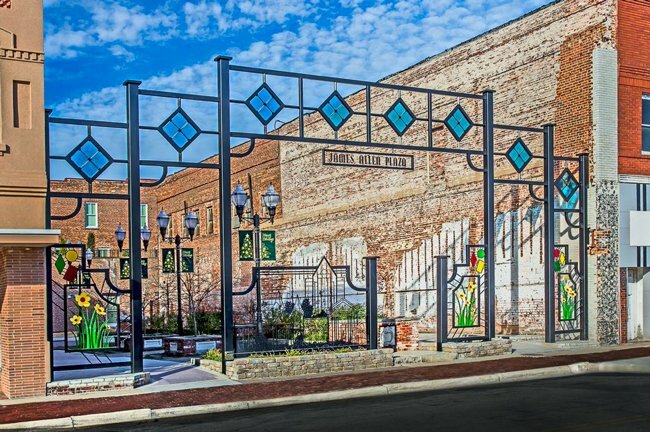 As part of downtown Florence‘s revitalization project, the city has created the James Allen Plaza – a community square for concerts, gatherings, and public art displays such as metal sculpture crafted by renowned Lancaster artist Bob Doster. The plaza’s iron gate, which is the work of Bishopville iron artist English Cooper, leads to the entrance of Victor’s Bistro, a popular restaurant located on the ground floor of the Hotel Florence. Mike Gann of Hartsville provided the glasswork within the entrance gate. The plaza is also the site for regular celebrations such as First Fridays each month and the annual Night Before Thanksgiving party. These events along with performances by local students, artists, and musicians draw locals to the epicenter of the downtown commercial district.